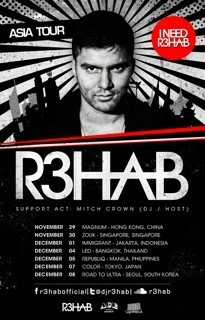 Fadil El Ghoul, better-known as R3hab is now about to embark on his first Asia tour of 2012. Kicking-off on November 29th, this seven date seven-country tour sees him start off in Hong Kong and finishing up 10 days later in South Korea. R3hab will bring his take on electronic music to some of the world’s premiere venues across Asia, from Zouk (Singapore) to Colour (Tokyo), giving Asian fans their only opportunity this year to see him. Having dropped ‘Living For The City’ with fellow Dutch group Shermanology as well as producing for Havana Brown and Enrique Inglesias and remixing for the likes of Cherry Cherry Boom Boom – you could say Fadil is on a roll. ‘You’ll Be Mine’ with Havana Brown has been certified Platinum in Australia, Enrique invited him to join a three week writing camp for his album as one of only two European producers and his Shermanology collaboration is heading straight for the top of the Beatport chart. The full tour schedule is listed below.